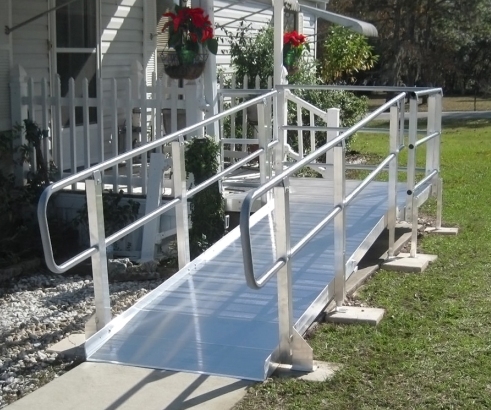 Prairie View Industries, also known as PVI, wheelchair and scooter modular ramps can be configured to meet your specific needs. Prairie View Industries, also known as PVI, wheelchair and scooter modular ramps can be configured to meet your specific needs. Call Us today for a custom quote. Accommodates a rise up to 60"
Handrails - Double 11/2" bar, standard height 36-38"
Optional handrail designs available upon request. White powder coated handrail available as an option. There may be a few Required Items to purchase, depending on your particular situation - ie. Pad, if ramp starts on a soft surface. For a custom quote, use the Contact Us page to send as much info as possible & to receive a specs form.